Announcement Welcome to Diddlebug! Thanks for visiting! 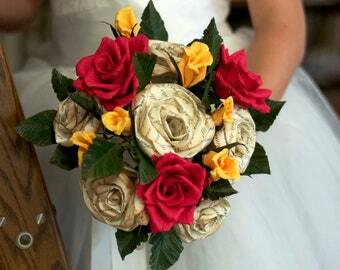 Diddlebug is your place to get paper flowers for weddings or any occasion. I use book pages, sheet music, colored paper, maps, any thing that is papery. Please understand that most of the flowers in my shop are made to order so they can take some time to make depending on how many you order and how many orders I currently have in line to be made. If you need your flowers by a certain date that is coming up soon, be sure that I know about that deadline so that I can try to rush your order. I am typically at about 5-6 weeks to get your order shipped out depending on how busy I am at the moment. I am not able to begin work on your order until you pay for it. So please keep that in mind, especially if your order is being rushed. If you are not in the US and are interested in getting something from my shop, send me a message with what you are interested in and where you are located and I will find out about shipping for you. Welcome to Diddlebug! Thanks for visiting! Charlene was very quick to respond to my inquiry, and equally as fast in getting the order out! It came earlier than expected, and was exactly what I was looking for. The flowers were better than pictured as well! Thanks Charlene! Exactly as pictured and seller was phenomenal to work with!!! She made it so easy to get it just right and shipped it well packed and quickly!! My daughter will love it! I was afraid they were going to be bigger than I was expecting, but they were exactly the right size. Thank you. I'm an artist who found that books destined for the garbage can be recycled into something wonderful! When not playing with my kids, I do a lot of theater things. While directing Wizard of Oz, I was given some roses in a bouquet. I was looking at the flowers and thought that I could make them out of paper. I had a lot of old books that were going to be recycled from the library from a previous show (Music Man and the library set, I had cut the spines off of books that were going to be thrown away but couldn't bring myself to throw away the pages even though that was their original destination.) So, I started making flowers out of the book pages to use them up and they looked sort of pretty. And being a book lover who is married to a librarian, it suits me quite well. I am having so much fun working on people's weddings to create bouquets and flowers they can keep for a long time or on other projects that use my flowers. I love the community feeling on Etsy that makes it feel like you are working on a project with a friend. My shop is named Diddlebug after my daughter who is currently 4 years old. She used to make a little sound like "diddle diddle" when she was mad as a baby and it would always make us laugh. Now Etsy is allowing me to pay for her dance lessons and her brother's piano lessons which is really fun. Thank you for looking at my art. Please remember that colors may vary slightly depending on your computer monitor. I want you to be happy with my products. Please discuss with me if there are any problems and I will try to get them resolved. I accept paypal and credit cards via Etsy. People ordering in the state of Michigan will be charged sales tax. I ship using USPS and will include tracking information on everything shipped domestically. For international orders, I will work with you to find the best shipping method. Once I ship your item, I am not responsible for what happens to it with the post office or in the mail. I do not guarantee any specific delivery dates. Your shipping costs include the cost of a box and shipping materials. If the actual shipping charges are well below what you are charged (depending on your location or if I am able to use a smaller size box or something), I will refund you the difference. If you would like special shipping additions like extra insurance or expediting, let me know and I will notify you of the additional fees. I usually use priority mail (2-3 day service) with USPS. At this point, I do not have many other countries listed for shipping on many items. If you are not in the US, but are interested in something, send me a convo and I will check with the post office to get a quote to ship it to you. Tracking and shipping is sometimes unreliable when outside of the US. I do my very best, but can't be held responsible for hold ups in customs or if things do not make it in time. Please allow plenty of time for shipping for international. Here is a partial list of the books that I currently have. Not all books have enough pages left for a lot of flowers. This list may not be always completely up to date. Please contact me before ordering if you have a very specific book in mind. If you have a specific title in mind, I am often able to find it for you. Also contact me for information about the coloration of the pages in these books. They range in color from bright white pages to very yellow and it doesn't always correspond to the age of the book. Also, some books have pages that are more brittle than others. Modern means that it is an almost brand new book. I make your flowers based on the order in which they were purchased and when you are needing them. I am often able to rush an order for you depending on the size of the order and how busy I am at any given time. I work very hard to get your order to you in time for your event, so be sure to let me know any timeframes you are working with so I can plan. My typical queue is about 5-6 weeks but be sure to talk to me if you need your flowers earlier. Once my order is made, how long does it take to ship to me? Within the US, I use priority USPS which typically takes 2-3 days for most locations. With international orders, I also use the post office and timing varies greatly depending on where you are. Most European destinations seem to take about 7-10 days. Will my flowers stay fresh? I have now had paper flowers that I have made 3-4 years ago and they still look exactly the same as the day I made them. Depending on what materials your flowers are made from, they may break down. Many book pages are very acidic and get crumbly over time. I try not to use book pages that are crumbling when I make my flowers. How do I care for my paper flowers? Paper and water do not mix well, so don't get your flowers wet. Keep your flowers out of direct sunlight, it seems to affect both the colored paper and the book pages. If your flowers get dusty, the best way to clean them is to use a can of air, often used to clean electronics.